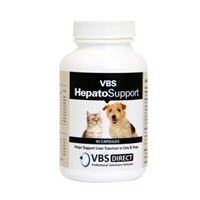 VBS Direct Ltd - VBS HepatoSupport Capsules - Innovative solutions for the veterinary professional. Hepato Support contains a standardised extract of milk thistle along with a full complex of B vitamins and alpha lipoic acid to help promote normal liver function. The active bioflavonoid complex in milk thistle, silymarin, increases the uptake of hepatic glutathione and stimulates hepatocyte protein synthesis. The milk thistle used in these formulas has been standardized to contain 80% silymarin and 30% silybinin, the highest percentage available in any liver nutritional product. One capsule twice daily with meals for every 10-20kg body weight. Animals less than 10kg, give one capsule daily with meals. Capsules can be given whole or opened and mixed with food.